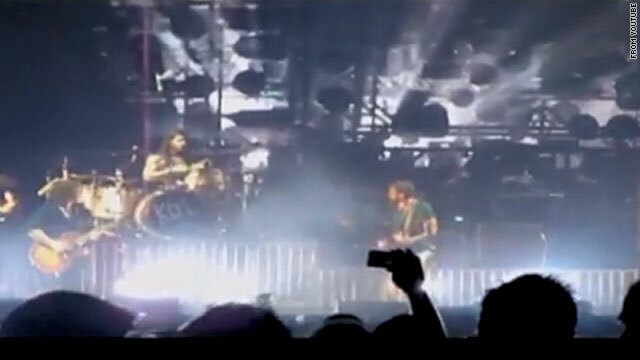 (CNN) -- Pooping pigeons forced the Kings of Leon to abandon their St. Louis, Missouri, concert after just three songs Friday night, the rock band's management said Saturday. An infestation of the birds in the rafters of the Verizon Amphitheatre bombarded the musicians as soon as they took the stage, according to Andy Mendelsohn of Vector Management. "Jared (Followill) was hit several times during the first two songs," Mendelsohn said of the band's bassist. "It's not only disgusting -- it's a toxic health hazard. They really tried to hang in there," Mendelsohn added. Followill, who describes himself as a "germophobe," said there was already poop on his pedal and carpet when he walked out on stage. The aerial attack began during the opening song -- "Closer" -- when he was bombed in the face. His bass tech wiped most of it off with a sanitary wipe, he said. Excrement struck each of his arms over the next two numbers, he said. "I was hit by pigeons on each of the first three songs," he said. "We had 20 songs on the set list. By the end of the show, I would have been covered from head to toe." Followill said he couldn't see the pigeons above him and he had no idea how many there were. "The last thing I was going to do was look up ... but if that was only a couple, we must have caught them right after a big Thanksgiving dinner," he quipped. The group was determined to play for St. Louis fans even though they had fair warning earlier about the pigeon problem. Opening bands The Postelles and The Stills came offstage complaining of getting riddled with large amounts of excrement, their publicist said. "The Kings of Leon decided to carry on regardless," they said in a statement released Saturday. "The band felt it would be unfair to the fans to cancel the show at that late moment." "We couldn't believe what The Postelles and The Stills looked like after their sets," Followill said. "We didn't want to cancel the show, so we went for it. We tried to play. It was ridiculous." Followill's mother called him when she heard from friends at the show that it had been abruptly ended. "I was attacked, Mom, but not by humans," Followill said he told her. Venue managers told the band's representatives earlier Friday about "a significant pigeon infestation problem with summer shows over the years, but they were doing all they could to fix it," the statement said. "We want to apologize to our fans in St. Louis and will come back as soon as we can," Mendelsohn said. Concertgoers were apparently spared the aerial bombardment. "No fans got pooped on as far as we know," the band's publicist said. Verizon Amphitheatre and concert promoter Live Nation did not immediately respond to CNN requests for comment. The band is set to perform at First Midwest Bank Amphitheatre in Chicago, Illinois, on Saturday night.